Breeding wader populations on the reserve have been steadily increasing over the last 6 years, and in 2017, there were 68 pairs of lapwing, and 53 pairs of redshank. The previous focus for our habitat management has been Aveley Marsh, and this is where the breeding wader populations have been strongest in recent years. Since 2015 however, a programme of habitat improvement works have been underway on Wennington Marsh, a 94ha area of wetland habitats, the majority of which (81ha) is coastal grazing marsh. This work has included the creation of over 8km of shallow scrape and footdrains, and a 4.2km new combination predator fence. These improvements saw a considerable improvement of breeding wader numbers on Wennington Marsh in 2017 – nearly 40 pairs compared to less than 10 in previous years. 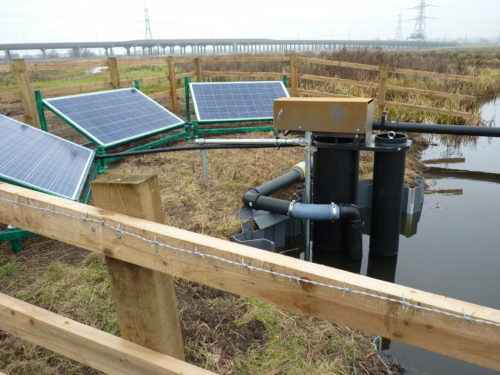 The final phase of work on Wennington was completed in November 2017 when three solar powered water pumps were installed at key locations on the marsh. We can use these pumps to manage water levels in the network of shallow scrapes and ditches that were created across Wennington in 2014/15, helping to ensure that Wennington continues to develop as an excellent habitat for breeding waders and other wetland wildlife. These pumps are intended to keep the network of scrapes and footdrains topped up with water during the critical spring and early summer period. Supplied by Aqua Delta from the Netherlands, they are capable of pumping 35m3 of water per hour under good conditions, and can lift water a height of 2m. 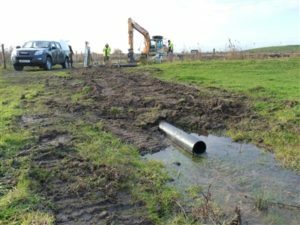 Our pumps will improve water level control across 34ha of Wennington Marsh. They have been installed so that each pump can service two adjacent fields, by using a simple system of pipes and control valves. Our thanks to Veolia Environmental Trust through the Landfill Community Fund, the Land of the Fanns Landscape Partnership Scheme through the Heritage Lottery Fund, and the Environment Agency, for helping fund this work. 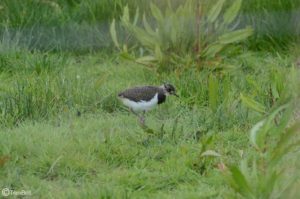 We hope that increasing numbers of young lapwing and redshank will prove the value of the time, effort and £50,000 investment – saving threatened species in an eco-friendly way. STOP PRESS – numbers of breeding waders on the reserve have increased again in 2018, and this saw 55 pairs of breeding waders on Wennington benefitting from the wet conditions that the solar pumps have helped us to maintain.